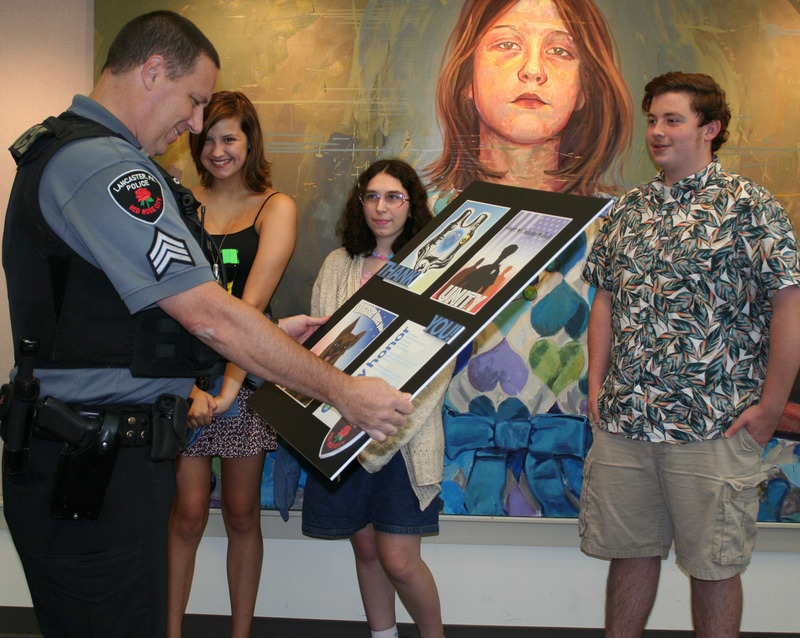 PCA&D’s summer pre-college class “Design for Social Good,” taught by Bill Dussinger, designed a poster to thank our local police and highlight the fact that the community appreciates all they do for the residents in the community. 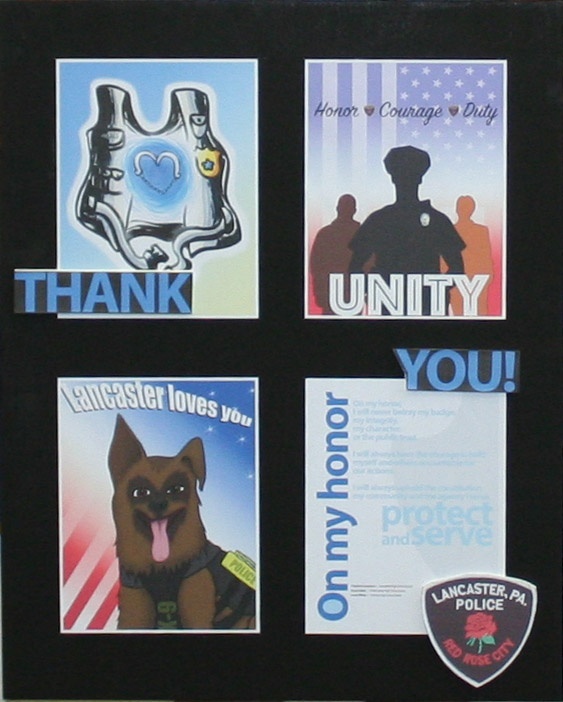 Each student in the class designed a quadrant of the poster that was presented today to Officer William Hickey, of the Lancaster Police Department Officer Hickey said he would hand the poster in the department’s squad room, so all patrol untits will see it as they start their shifts. “We really appreciate it,” he said, and talked with the students about the work of a police officer. PCA&D Communications Arts professor Bill Dussinger’s “Design for Social Good” class is taught yearly as an elective in PCA&D’s BFA program. This summer, Bill is bringing a version of the class to high school students as part of PCA&D’s Summer pre-college studio classes. Students draw upon current topics as inspiration for their own unique campaigns while discussing case studies of past movements, individual works, and other artists in this field. In this graphic design course held in PCA&D’s computer lab, students apply design techniques using their preference of digital or hand tools, to communicate messages that are important to them. In addition to the poster for the police department, the class created a peace poster, infographics on topics of the students’ choice, and cheer-Up cards to randomly distribute on the last day of class. Koryn Galen, McCaskey High School junior, said, “There is so much negativity in the world. I want to do something or anything to remind people that there is good in the world. Plus I love art.” Koryn, who believes words do affect people, created an infographic to communicate a message about the suicide epidemic, especially how the LGBT community is impacted by suicide. Lucas Tiffany, Octorara High School senior, created his infographic on Anxiety Disorders. “I want to focus on anxiety to let people know that they aren’t the only ones who feel the same way.” He also wants to use art to communicate about other problems, such as animal abuse and homelessness, that are everywhere. Lucas hopes to study Graphic Design in college after he graduates from high school. He plans on applying to PCA&D and would like to take the Design for Good class that Bill Dussinger teaches for the BFA students. View the art created in the Art for Social Good class.